Everywhere I go, I am convinced that history will be made this year. One of the most common questions I have been asked by some is How can we be a part of #PeopleMakingHistory? Fostering accomplishment of your personal goals. Through Pathways, Toastmasters International has taken a big step in helping us serve you better as a member. The development of personalised paths and introduction of a structured Mentoring Programme in Pathways will go a long way in helping us prepare you for future professional and personal assignments. If there is one thing that I could single out as my personal challenge to you as a history maker is to begin your Pathways journey, complete and register at-least 1 level on your chosen path. Create a schedule that will allow you to complete your Level 1 by the time we get to OURCon so that we can celebrate together at the conference. This early target is also meant to ensure that if life happens, you have enough time to ensure your Level 1 is registered by 30 June 2019. 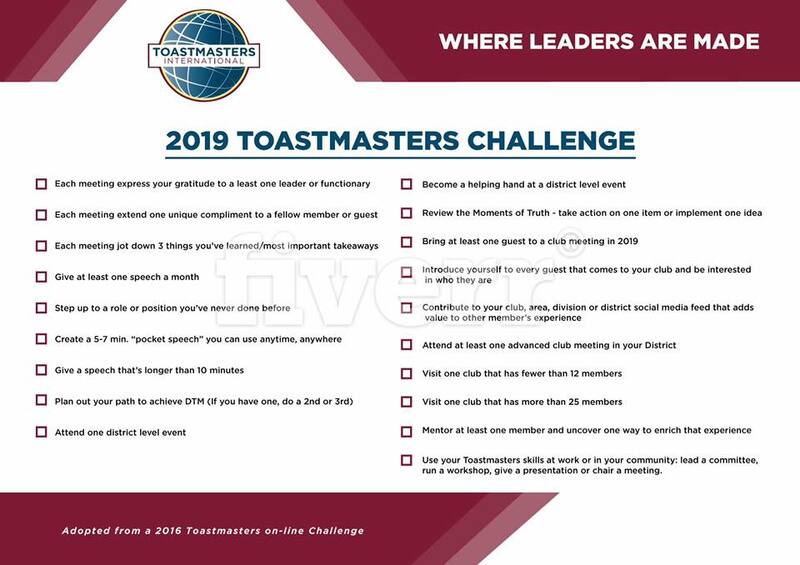 If you have already accomplished the above and/or are feeling really brave, I have attached below a 2019 Toastmasters Challenge shared with me by our 2nd Vice President for Toastmasters International Margaret Page, DTM. You can challenge yourself or find a partner to go through this challenge with and I promise you, your life will never be the same after this. Your success is our priority and there is nothing that my team of district leaders and I would like more than you achieving your goals. Together we can do this, let’s make history together!